The Somerville Times has their predictions on this year's municipal races published in this week's Newstalk. It seems that longtime Ward 3 School Committeman Adam Sweeting is out, opening the door for new representation. A couple of names have been floated, but no one confirmed. 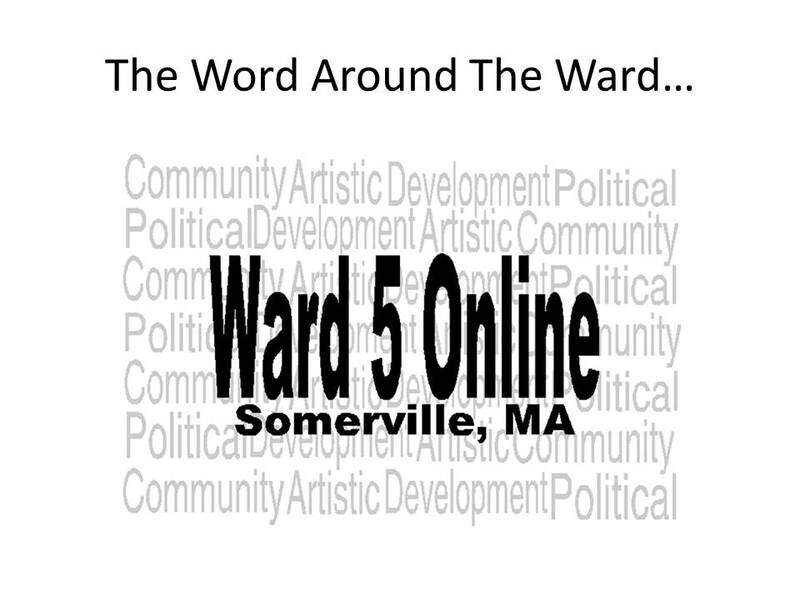 Happy Birthday to Ward 5er Ron Passerini who is celebrating this week! A job well done to the DPW on their storm response for Tuesday and Wednesday. Although some neighbors were frustrated about plowed sidewalks, most residents were happy to make a new path for pedestrians. I have to admit that my neighborhood is looking very good. What some residents were not happy about were the large amount of parking spaces in the Magoun Square parking lot that were taken up by plows and Police. I heard many complaints while having dinner at Olde Magoun's Saloon. Feel free to voice your thoughts in the comment section below. How is everyone handling the lane shortage on the Ball Square bridge? My own experience is that there is some backup, but that it flows pretty quickly once the light turns green. Feel free to comment your thoughts below. Mayor Joe Curtatone caused quite a stir when he supporter protestors on I-93 recently. What are your thoughts on his comments? Curtatone, a reasonalbly intelligent guy, was way out of line with supporting those protestors who blocked Route 93 to traffic. While he, I,and countless others in Somervile, and many others throughout the country, support the messages delivered by protestors; blocking traffic including the possibility of emergency vehicles; puttimg citizens in harm's way, is and was outrageous on his part. He could of, and should of, qualified his comment by voicing his support of the protestor's message, but not the method used by blocking Route 93. I wonder what Mr. Curtatone's response would of been in regard to the the traffic backup caused by those imbeciles if his wife and/or one of his sons, were in an accident on Route 93, north of the protest point, and in need of immediate medical attention. I have several Black-Americans friends,none of whom supported the route 93 fiasco. Also, it was brought to my attention by my friends, according to the news pictures shown on tv, no black Americans were pictured at that venue. It appears the Mayor has no problem with other persons being put in harm's way so long as not his family. Because of Joe Curtaone's insesitive comments regarding the hundreds, possibly thousands, of innocent "victims" caught up in the backlog of traffic; and literally, potentially persons put in harm's way if needing medical attention, I have lost all respect and future support for Joe. He may regain my respect and future support, if he is man enough to voice an apology for having had approved the protestor's causing that traffic jam. He is well okay for approving the message delivered; but not the physical means in they did it.